Holistic Goal Formation is a process used to work with organizations or groups to help them develop a holistic goal or a ‘guiding star’ for their work and a vision of where they want to go. It is a process that works well alongside a permaculture design process incorporating a land use design, but that can equally be used to just form a vision for any organization, community project or group. It is a visionary process creating a guiding star for the work of the group, starting by looking at the resources, social and ecological, it has available, what is important for their quality of life, and finally what the vision is for the future. Holistic Goal Formation is a method for successfully creating a group or organizational vision based on input from all stakeholders in a group, that is representative of the collective goals, and implementable in terms of a realistic time-framed action plan. Holistic goals act as the guiding principles for all actions and decisions that are taken, and help to hold the group to their agreed upon objectives in times of conflict, change, confusion or debate. Articulation of holistic goals serves to re-orient group members to the aims they are striving to achieve, and prevents sidetracking and professional distraction. In articulating a holistic goal, the process ensures that the group is not viewing their aims one-dimensionally. A holistic goal takes into account the impact each decision will have on a group in a variety of facets: socially, economically, ecologically, spiritually, etc., in other words holistically. Thorough articulation of holistic goals improves social dynamics, efficiency and long-term effectiveness of any group effort. 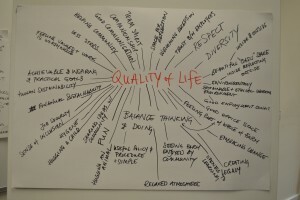 The process: Hold a circle in which all stakeholders are given a platform to share where they are coming from at that given moment – this could lead to the airing of old conflicts, the articulations of current issues or existing tensions, as well as the sharing of dreams and visions of what could be. The circle is facilitated with the rules of the Native American talking stick, in which the stick rotates around the circle in one direction, with the person holding the stick given the opportunity to speak without interruption. Only the one with the talking stick speaks. Then the stick goes to the next person who is then allowed to speak their truth. No responses are made to any one out of turn. The stick goes around as many times as is necessary to hear all that people are bringing to the process, and then we proceed to formulating the vision statement. The next step is to determine aims and objectives of the group as according to the guiding principles laid out in the vision statement. From these aims and objectives we move on to creating a prioritized action plan for moving forward, in which the aims and objectives are broken down into specific actions with specific steps. By determining the priority of each action, the group will then formulate an action plan, by consensus, of which projects should be undertaken immediately or in the short-term in order to meet the aims and objectives which will ultimately enable the group to enact the vision. Each action as it is placed on the action plan must have at least one member of the stakeholder group that will manage or be accountable for that action, as well as a timeframe and a budget. The hope is that at the end of the Holistic Goal Formation process all stakeholders share the same vision, are in agreement about the main goals of the group, and know how they will achieve those goals, with what funds, and who is responsible for what. The process has been shown to increase group cohesion and build motivation as well as to direct a group to taking effective actions that will directly realize their dreams.